Let’s face it, yearbook headshots can be boring…that was until now. Thanks to 16-year-old Draven Rodriguez, a senior at Schenectady High School in New York. He wanted to pose with his cat, Mr. Bigglesworth. 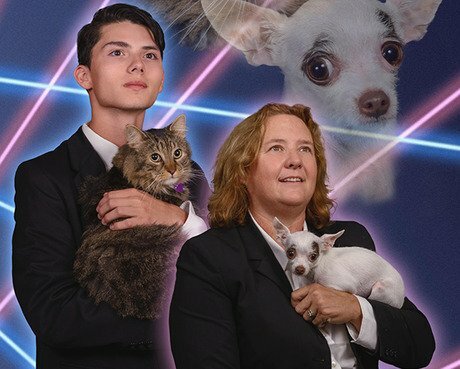 He knew that bringing his cat to school for the yearbook photo would be out of the question. So he started a petition featuring his photo with Mr. Bigglesworth, and got more than 7,000 signatures. The good news for Rodriguez was he didn’t even need to show it to his principal, who loves animals. So, she posed with her Chihuahua, Vivienne, and their High School yearbook now has a photo of Rodriguez holding Mr. Bigglesworth and Principal Wilkinson holding Vivienne. The photo, which was taken last week with Principal Wilkinson, will appear in the 2015 yearbook on the principal’s page. A photo of him holding Mr. Bigglesworth will appear on a seniorclass page in the yearbook, and his headshot features him wearing a button in his lapel with Mr. Bigglesworth’s face on it. Rodriguez was hoping to leave a legacy at his school by showing him with his rescue cat. Since the photo appeared online, fans have been sending donations to the school, which will be sent to a local animal shelter. Rodriguez and Principal Wilkinsonare pleased that this is also raising awareness for shelter animals.